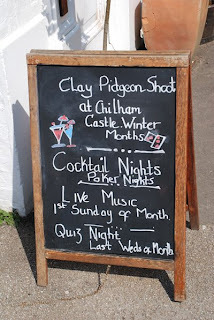 This is th board for a pub called White Horse in the village of Chilham a few miles from Canterbury. Excellent pic! Sounds like they are having fun in Chilham. On this selection I’ll pass on the first activity, choose the second and third. Do you know what the quiz is about? I hope the Pidgeon Shoot isn't in the pub! Does sound like a lot of fun activities though. I know that a lot of bars in the U.S. have quiz nights, but I've never done one. Clay pigeon shooting is fun :) and doesn't involve real pigeons in case you were wondering. Pub quizzes are usually about general knowledge and if you are part of a village it is a lot of fun. This is great and sounds like so much fun!